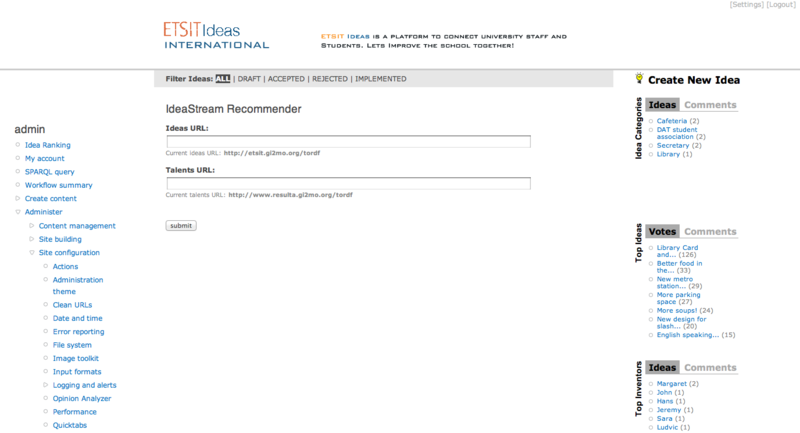 Gi2MO IdeaStream Recommender is a Drupal extension that works together with the IdeaStream module and allows to display a ranking of ideas or idea reviewers based on the extended profile information of the innovators (skills, work history etc.). 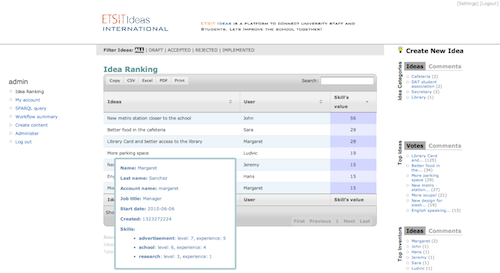 Info: An extension to IdeaStream that shows integration with HRMS and allows to generate idea rankings based on user profiles. In particular this module presents the integration with Human Resources Management System (Talent Management System). The module assumes that links between person profiles in HRMS and user profiles in Idea Management have been already made and exploits them to judge how competent are particular people in relation to given idea topic. 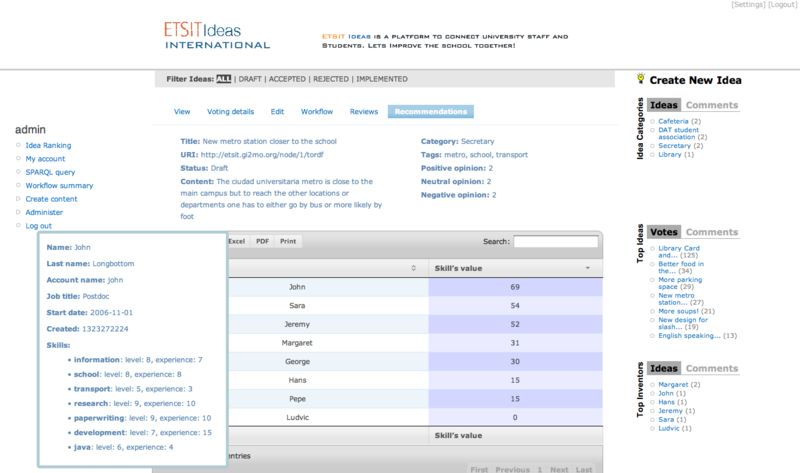 Based on that, it is possible to view idea ranking for all ideas gathered in IdeaStream and idea reviewers ranking for every individual idea. 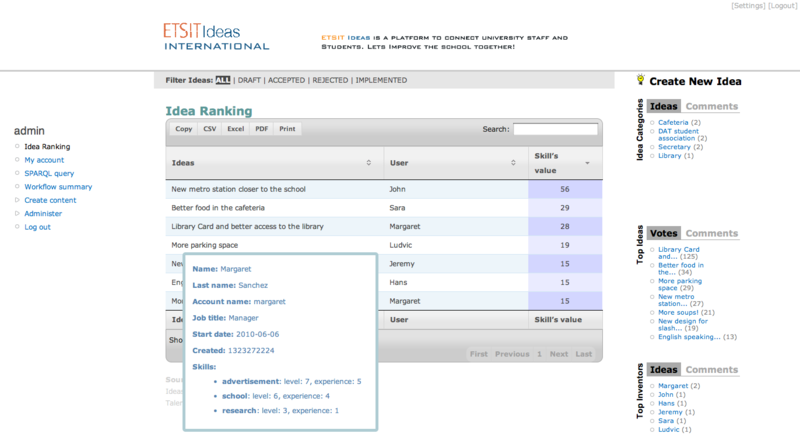 An example of idea ranking generated for ETSIT Ideas instance. For demonstration purposes we assumed a certain structure of CV data based on the ResumeRDF and FOAF ontologies. The data in Idea Management Instance should be exported following Gi2MO ontology guidelines. The availability of those functionalities for particular user roles or groups can be customized using User Permissions in the Drupal administration settings screen. For details on the ranking algorithm please see the related news post, for information on the integration of Idea Management Systems with other enterprise systems please see the modeling section. Overview of Gi2MO IdeaStream Recommender capabilities and options.